Jump Into ..Pool Of Personal Resort!!! 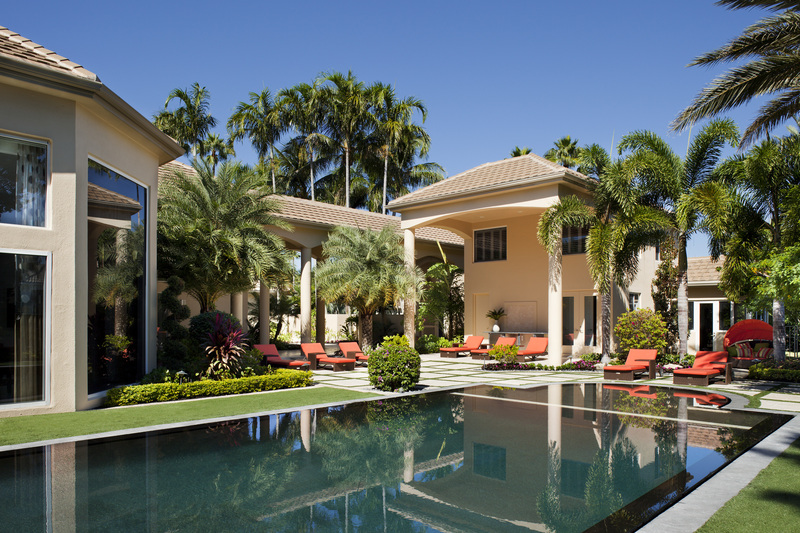 Take a dip in these oasis and resort inspired backyards! One look and the eye can see that crisp, cooling, energy surrounds with a touch of warmth. The outback area of homes is the place where most choose to make their homes feel like a resort or tranquil spa. Simple straight lines with geometric formality are a modern yet tradition in the patio or outdoor furniture style. Using a pop of color adds depth and spice to the usual natural tones. 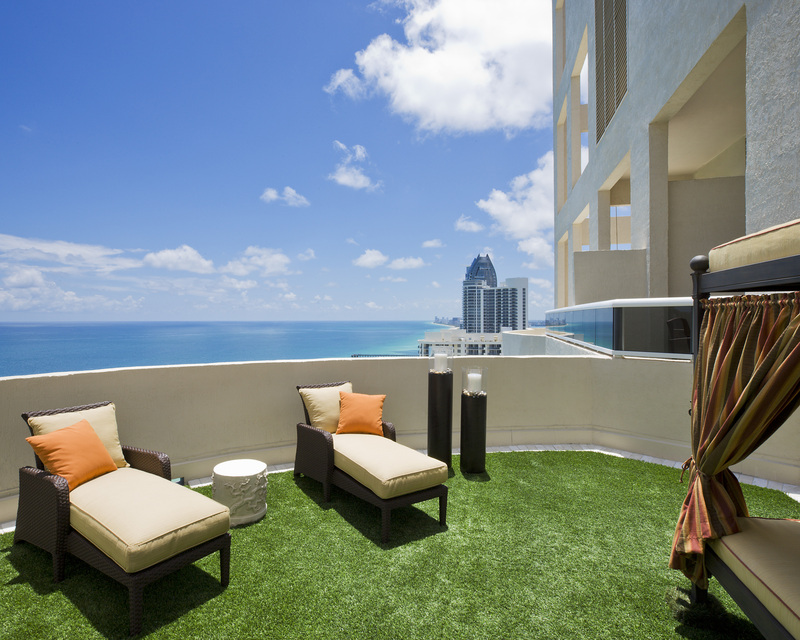 A great inspiration for color is the nature that surrounds or is influences the outdoor space. Enhancing on every level. Located in modern day Pakistan is where the first pool also known as the “Great Bath” at the site of Mohenjo-Daro, it was the first swimming pool that is known and was lined with bricks and a tar based sealant sometime in the third millennium BC. During the fourth century BC many pools were decorated with many steps, scrolling designs, mosaics, and potted lights. Today, we are seeing this indulgent décor once again in the latest of outdoor pools, spas, etc. Swimming forward in time, the first vessel or ocean liner to contain a pool was in 1907 on the White Star Line’s Adriatic . Today most pools are heated but the first pool that was heated was built by Gaius Maecenas of Rome in the first century BC. San Alfonso del Mar in Algarrobo, Chile, holds the world’s largest man made pool. This wonder cost over Two Billion Dollars to build and an additional Four Million to maintain per year. It stretches over eighty acres and is one thousand and thirteen meters long. The deep end is deep with a depth of one hundred and fifteen feet. Technology also plays its part in this pool out of this world, as the suction and filtration system is pumped on a continual basis with water from the ocean; resulting in the crystal clear water that is controlled all by a computer system. It takes sixty-six million gallons of ocean water to fill this enormous pool. 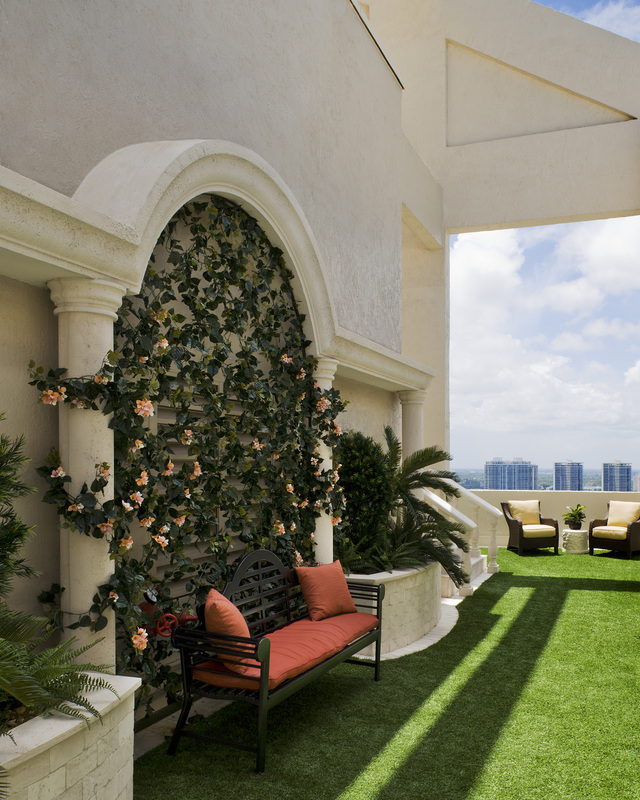 The intersecting lines on the semicircular wall make this balcony spectacular. 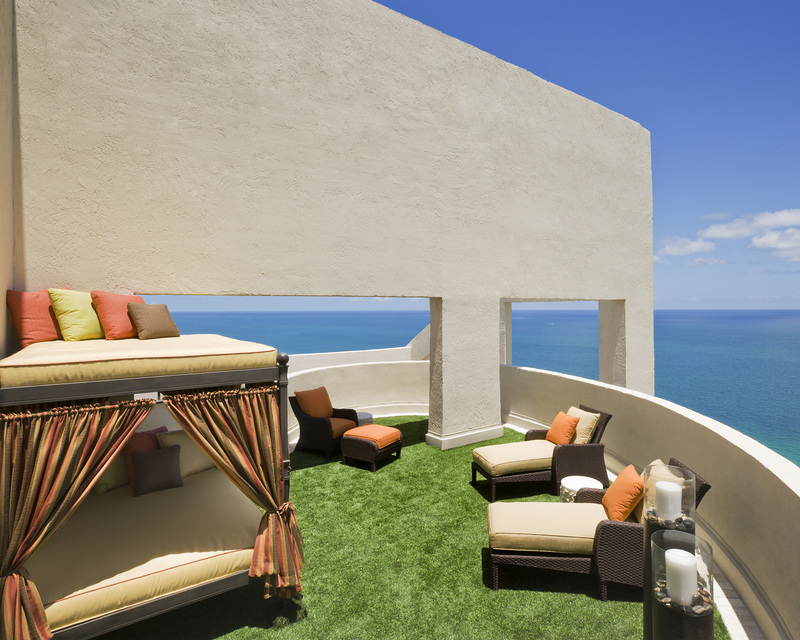 The use of shapes intertwined with the horizon makes the outdoor space seem grander than life. The sky bed or canopy bed that was converted into a “bunk-bed” style lounging area is another way of creating more space and leads the attention of the eye upward. This unique piece of furniture serves as a twilight delight to feel suspended in the sky and be closer to the stars when laying on it at night. Candles that are flame-less add an extra touch of glam and ambiance. From the minute you look at this picture one can definitely feel like they are being pampered. 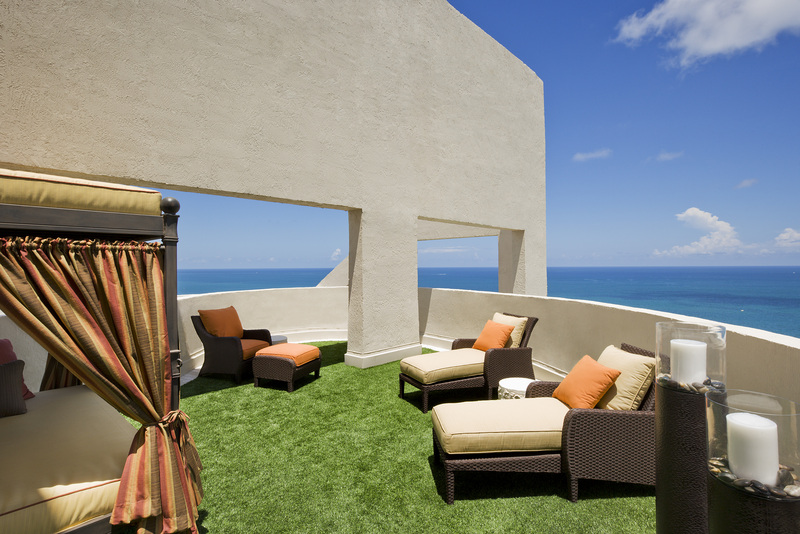 Astroturf or synthetic grass is trending now in many homes and commercial spaces. The added bonus is the minimal maintenance of the grass as well as the veneer appearance. Freestyle in strokes, and flagged, you can tap on the fact that these outdoor spaces make you feel like you can float on water.